How can you tell if a lake is healthy? It’s not as simple as what’s in its water and on its shores. 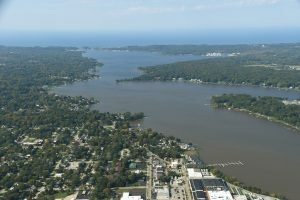 Lake Macatawa’s watershed – the area that drains into it – comprises most of the greater Holland/Zeeland area and is made up of neighborhoods, shopping and business districts, and farmland. Over the past five years, local partners have worked to improve conditions in Lake Macatawa and its watershed by reducing sources of phosphorus through the Project Clarity initiative. There are several important indicators we use to tell not just how healthy Lake Mac is, but the health of its watershed as well. Phosphorus is a nutrient that can lead to algae blooms and is attached or accompanied by sediment that makes the lake appear murky. These conditions are detrimental to aquatic life and limit the number and abundance of species that can be found in the lake. 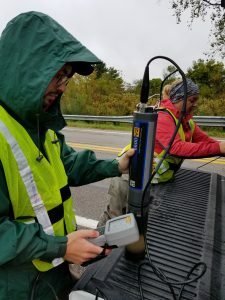 Researchers from the Annis Water Resources Institute at Grand Valley State University continue to monitor conditions around Lake Macatawa. They take readings at five locations around the lake several times a year, with additional support from Hope College and a number of volunteers. Along with phosphorus, the team measures algae concentrations and the clarity of the water. The average annual concentration of phosphorus in the lake was 72 parts per billion in 2018, the lowest annual reading since state and federal monitoring began in the 1970’s. While these levels are still not low enough for the lake to be considered healthy, the trend is encouraging. We need to bear in mind that there are going to be ongoing stressors that impact the health of the watershed. Some of these are beyond our community’s immediate control, such as ongoing changes to our climate. 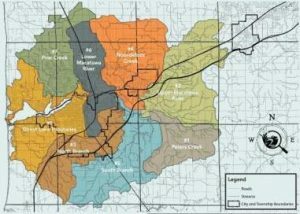 However, there are other factors that we can more easily address, like developing our community wisely and finding ways to encourage water to infiltrate into the ground, rather than pave land and pipe water to the nearest stream. Project Clarity and our partners have been able to implement more than a hundred projects since the effort began in 2014. While there are good examples of these types of green infrastructure projects, we need these to become the default way – rather than the exceptions – of building, farming, and doing business.  Dan Callam is the Greenway manager at the ODC Network. He helps oversee Project Clarity as well as the Macatawa and Kalamazoo River greenway efforts. Dan graduated from Hope College in 2009.